An artist who randomly vandalised nearly 50 cars for a project said the owners should be happy they were part of his "creative process". Mark McGowan, 37, will exhibit pictures of himself scratching the vehicles' paintwork in London and Glasgow. He said he had "keyed" 17 cars in Glasgow's West End in March and 30 in Camberwell, south London. The Met police said the act was criminal damage and if allegations are made they will be investigated. 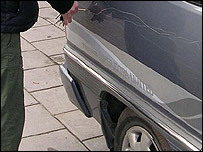 Mr McGowan added: "I do feel guilty about keying people's cars but if I don't do it, someone else will. "They should feel glad that they've been involved in the creative process. I pick the cars randomly. "I got the idea when my sister and brother-in-law's cars were keyed. Is it jealousy that causes someone to key a car? Hatred? Revenge? "There is a strong creative element in the keying of a car, it's an emotive engagement." A Metropolitan Police spokesman said: "Clearly this would be criminal damage and if we receive any allegations we will take them very seriously and investigate." Meanwhile, Strathclyde Police said: "We are aware of Mr McGowan and have no comment to make at the moment." His work will be displayed on Wednesday night in a launch party at The Arches, an exhibition venue in Glasgow. It is the latest in a string of bizarre stunts by the postgraduate in history of art from the prestigious Goldsmiths College in London. Mr McGowan, who has described himself as "the British alternative to David Blaine" nailed his feet to an art gallery last year - in protest against leaves. In 2003, he attracted the media's attention when he pushed a monkey nut with his nose for seven miles to 10 Downing Street in a protest over student debt. Michelle Jordan, a spokeswoman for the Scottish Arts Council, said it was unlikely Mr McGowan would receive any funding. "He is more likely to get a visit from Strathclyde's finest than any funding from us."